A German study called Urban Emotions provides new insights into how people experience the city emotionally depending on the design of traffic areas, the size and distance of buildings, and the dynamics in a park or on a frequently-used bicycle path. Cyclists feel the cold sweat of fear when trucks come too close. Pedestrians feel uncomfortable in the subway, but just around the street corner they enjoy their relaxing strolls. Spatial and social structures of a city cause both individually and collectively different feelings. The Urban Emotions project of Karlsruhe Institute of Technology (KIT) has developed methods to make these emotions measurable for later consideration in urban and spatial planning. “Under stress conditions, the skin’s conductivity increases, while the body’s temperature decreases. These reactions of the body cannot be influenced. Their measurements enable objective determination of emotions,” says Dr. Peter Zeile, head of the project carried out by the Urban Quarter Planning Group of KIT’s Institute for Urban and Landscape Design. Apart from urban planners, psychologists, sociologists, and geoinformatics experts are involved in the international project funded by the German Research Foundation (DFG) and the Austrian Science Fund. Using smart band sensors, scientists measure close to real time the physical stress reactions of test persons in different urban situations. At the same time, a 360-degree video camera attached to the bicycle or body records the surroundings, while the position of the test person is determined by GPS. The combination of the body’s resonance data with the images and position data allows findings to be obtained as to when and where the test persons experienced stress. 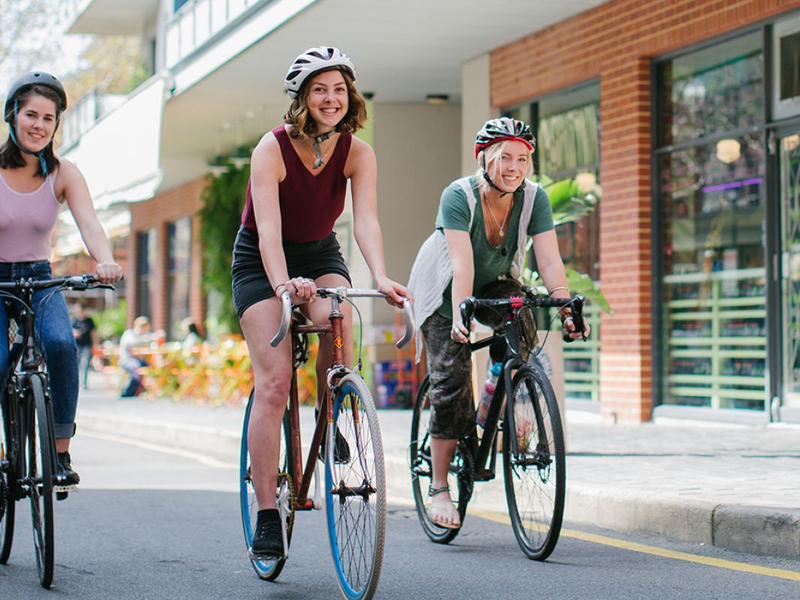 “We found, for example, that turning left from a lane with vehicles driving straight on means considerable stress for cyclists, and also bumpy roads make them feel up-set,” says Zeile. Digital urban research under Urban Emotions helps identify and eliminate locations of fear in the city and may serve as a basis for citizen-centred spatial planning processes. “Accessibility, for instance, means something different for the visually impaired and for wheelchair users. Needs that can be measured objectively have more weight in a discussion and facilitate decision-making,” says the scientist. In his opinion, the methods of Urban Emotions supplement and support established approaches to urban re-search. Measurement of emotions places man in the centre of planning and contributes to new perspectives in urban development. “In a city, in which cyclists feel safe, more people will use the bicycle instead of a car,” Zeile says.